All transactions are safe and secure with a reliable history in online purchasing behind each of our associates. Buy The Goonies Movie Logo t-shirt to own Goonies clothing and merchandise. The front of this tee displays the Goonies movie logo. The logo features the movie title underneath a silhouette image of the young Goonies cast holding hands with Sloth, the deformed Fratelli brother who becomes friends with Chunk (Jeff Cohen). This officially licensed bestselling tee is a classic tribute to the movie that put Astoria, Oregon on the map. Browse through to see the attractive women's version. You'll be ready to start your own search for pirate ships and lost treasure. 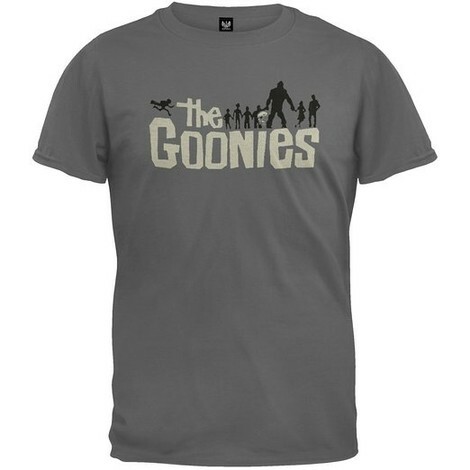 In addition to The Goonies Movie Logo tee above, browse the Goonies Clothing Gallery for more apparel like men's and women's clothes, kids shirts or hoodies.